During the winter months, like the North America people who head south to Puerto Vallarta to flee the chilly north, the humpback whales also travel to this area for the warmth. The protected temperate water of Banderas Bay is the ideal environment for these huge cetaceans to mate, give birth, and nurse their calves. 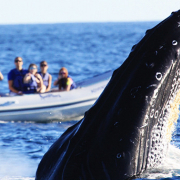 Migrating thousands of miles from the Bering Sea and the Arctic Ocean, these humongous marine mammals arrive off the shores of Puerto Vallarta every December and remain through March. You’ll be thunderstruck by the splendor of these gargantuan creatures as they rise from the surface of Banderas Bay or the Pacific Ocean. The imposing size of these aquatic mammals is enough to drop your jaw in amazement. You may even see a dramatic display such as a tail slap, a breach, or an explosive spray. Humpback whales are known for their fantastic appearances on the surface of the water close to the coastline. This species is famous among whale watching enthusiasts for their tendencies to put on a show. Look sharp and you may even spot a newborn calf swimming alongside its proud momma. New mother whales tend to remain close to the coast, preferring the security of coves and bays. Other marine mammals that you may see while on Banderas Bay include gray whales, false killer whales, Pacific bottlenose dolphins, spinner dolphins, and spotted dolphins. Join our naturalist expert guides for a trip into Banderas Bay on one of our splendid vessels, including spacious multi-decker power catamarans, sleek sailboats, quick and maneuverable zodiac craft, and even a replica pirate ship. 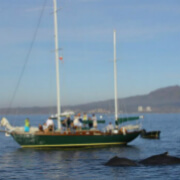 Enjoy a day of sailing on Banderas Bay to witness the majestic Humpback Whales in the wild. Our accommodating staff will ensure that you and your party have a fun-filled day aboard the Rhiannon, our thirty-eight-foot sailboat. Join our knowledgeable naturalist guides for a great photographic safari on Banderas Bay. If you are a shutterbug and a nature enthusiast, you do not want to miss this excursion from Puerto Vallarta. 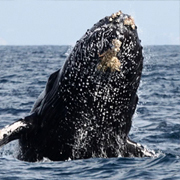 Our captains will get you close enough for some fantastic shots of these majestic animals as they breach the surface.